A Wee Burn Country Club Wedding is held at one of the oldest private country clubs in Connecticut. The club was named Wee Burn, Scottish for “small stream” by Andrew Carnegie and its golf course is among the toughest and most breath-taking in the Northeast. The main clubhouse is a beautiful Mediterranean styled building used for many a Wee Burn Country Club Wedding. Also available is the Beach Club, located in the Rowayton section of Norwalk. The history of the club, along with the uniqueness of the main clubhouse, and the beauty of the golf course and private beach make the Wee Burn Country Club an excellent venue choice. The couple photographed above, chose to celebrate their wedding day at Wee Burn and took advantage of the summer season by spending time together outside. 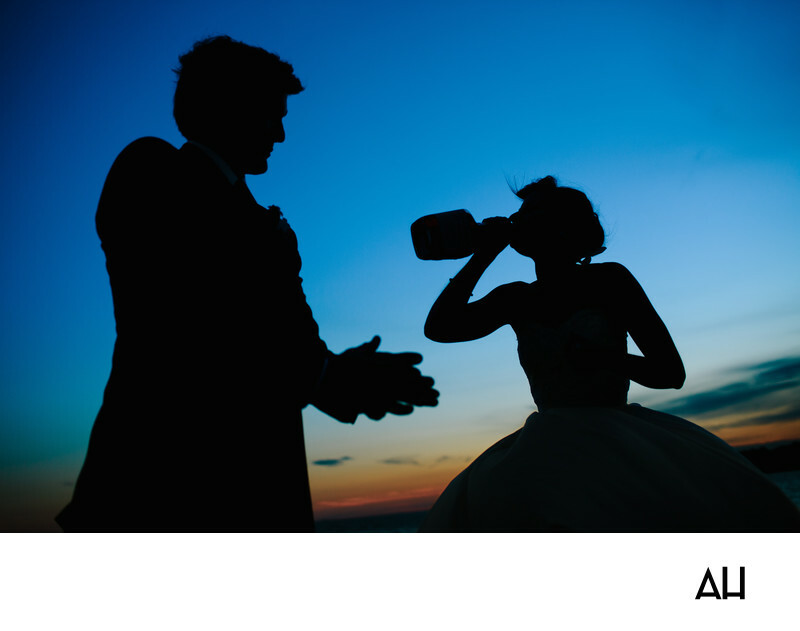 As the sky became alive with the colors of the sunset, the bride took a swig from a bottle they brought out with them. The groom waited patiently for his turn as he watched his now wife with loving attention, and that is when I took this candid picture. The effect of the silhouettes against the watercolor sky makes the image of the bride and groom appear like characters in their own personal story. Two kids running off into the sunset together, having the time of their lives.